ST. LOUIS — Bernie Sanders said Friday he will vote for Hillary Clinton for president, stopping short of a full endorsement of his Democratic presidential rival more than a week after the final primary contests. The Vermont senator said in an interview with MSNBC’s “Morning Joe” that he was “pretty good at arithmetic” and understood that Clinton had won more pledged delegates than he had during their lengthy primary. But Sanders has yet to call on his supporters to vote for Clinton and has not said whether he would campaign on her behalf. His latest comments seemed more aimed at acknowledging the inevitable while retaining leverage heading into July’s convention; Sanders believes the Democratic party isn’t doing enough to address poverty and to protect the interests of lower-income voters. 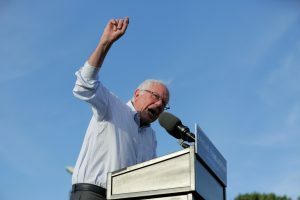 Sanders has said repeatedly since the final primary on June 14 that he will not end his presidential campaign until the Democratic convention in Philadelphia. He was making campaign stops on Friday in Albany and Syracuse, New York, to promote his campaign movement and rally supporters on behalf of likeminded congressional candidates. In St. Louis, meanwhile, Sanders’ allies were working to incorporate many of his ideas on trade, climate change and universal health care into the platform that will be adopted at the July convention. Sanders said in the interview that his focus was on representing at the convention the millions of people who voted for him and encouraging them to become part of the democratic process. In New York City on Thursday night, Sanders told supporters that his campaign is “just getting started” fighting economic inequality, changing the Democratic Party and bolstering Democrats running for Congress. Speaking to a packed hall in Manhattan, Sanders took something of a victory lap as he reviewed the states he won and the fact that many young people flocked to his campaign over Clinton’s. But he did not mention her name, let alone endorse her as leading Democrats have urged. Clinton earlier this month clinched the delegates required to carry the Democrats’ banner against Trump. While Sanders has acknowledged that he would not be the nominee he has yet to enthusiastically endorse Clinton, pointing to the need for the former New York senator and first lady to voice support for the issues that he staked his campaign on. He has been signaling the transition of his movement from a presidential run to one aimed at bolstering liberal Democratic candidates for Congress and offices up and down the ballot. In Syracuse, Sanders was holding a rally with congressional candidate Eric Kingson, who is seeking the Democratic nomination in next Tuesday’s primary to challenge Republican Rep. John Katko. Sanders was also delivering a speech Friday in Albany. Sanders has raised about $2.5 million for congressional and legislative candidates in recent weeks, sending out fundraising emails on behalf of liberals who could further Sanders’ message. Associated Press writers Laurie Kellman and Ezra Kaplan contributed to this report.